Gordon Gunn has been described as "one of the most exciting and innovative fiddle players of the times." Born & brought up in Wick, Caithness, Gordon was taught by the highly respected violin teacher Margaret Henderson who taught many pupils in the north of Scotland. Gordon is also a founding member of Scottish group Session A9 who were voted best live act at the 2012 Trad Awards. Whilst working with Session A9, Gordon also tours with Session A9's Brian McAlpine on keyboards and include a variety of musicians including Marc Clement and Phil Anderson on guitar and vocals. Gordon’s first album for Greentrax Records “Shoreside” was released too much critical acclaim and brought his music to a wider audience at home and abroad. "The band is tight and the musicians literally play their hearts out. Two slow pieces -"Orkney" and "Slow Air for Margaret" moved me to tears when I was fortunate to hear Gordon Gunn and the band play live at a concert in Inverness and they are just as powerful on the recording as they were in person. Gunn has a rare gift with the fiddle and the other musicians keep right up with him. This is a beautifully balanced album; if you're a fan of the Scottish tradition, it's not to be missed." Gordon is also a respected fiddle tutor, composer, session musician and producer. His compositions have been recorded by many artistes including Session A9, Ingrid Henderson, American fiddler Rodney Miller, "McGregor, Brechin & O'Headra" and harpist Rachel Hair to name but a few. Gordon is in demand as a session musician and has worked on over 50 albums to date. These albums include Aidan O'Rourke's "Sirius" and “Year X” project, Bruce MacGregor's "Lochness" well respected Skye musician Blair Douglas's latest releases “Stay Strong” and “Leanaidh Mi” and gaelic singer Eilidh MacKenzie's “Bel Canto”. 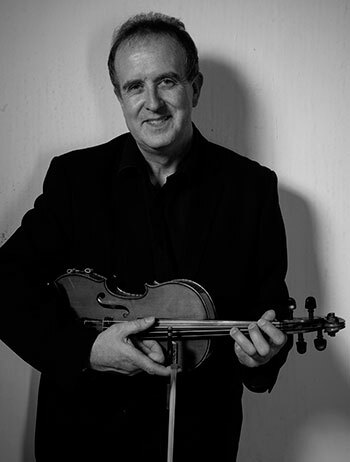 Gordon was a soloist in concertina maestro Simon Thoumire's Scots Fiddle Concerto, band member in Wendy Wetherby's "A Scots Quair", touring with Christine Hanson's "Cremation of Sam McGee" and was commissioned to write for Caithness writer George Gunn's "Atlantic Forest" project and some of these compositions feature on the latest album “Wick to Wickham”. Gordon has been in demand in various house bands for Celtic Connections including “A Scottish Songbook”, “The Clyde and the Commonwealth” and recently “Slainte Mhath”.